Continuing to grow from strength to strength, this year’s Belly Laughs Festival sees a whole heap of new venues, some hilarious stand-up comedy, bus tours and a dash of comic theatre, to add to the bargain. Set up by a group of comedy enthusiasts in 2011, the festival has attracted one of the most interesting comedy bills in the country and a host of local and international talent will take to the stage from 25 September – 6 October. This year headliners include Ruby Wax, Adam Hills and Stewart Lee, who will join local comedians such as Jake O’Kane, Paddy O’Donnell and Nuala McKeever, in tickling audiences at many venues across the City including the Cathedral Quarter’s Black Box and The Sunflower. Belly Laughs, which is a not for profit organisation, is run by volunteers and has a Management Board of nine. Heading it up is Festival Director, Peter O’Neill, who says the goals for the Belly Laughs Festival are simple: nurture home grown talent and provide audiences with a variety of funny yet affordable acts. He explains: “We’ve had a lot of fun teasing out our events and working with local talent and venues. Basically we’ve tried to design a programme with a variety and value that would allow all sections of the community to enjoy. That’s why we have programmed free and low cost events involving, not just stand-up comedy, but a range of genres such as book readings, poetry, cabaret, quiz’s, music, magic, workshops, kids events, seminars and even comedy bus tours. Pete says in Northern Ireland we have a GSOH and that our “banter” is second to none. One of the main reasons for this, he believes, is our troubled past and ability not to take things too seriously. “We were interested in exploring the boundaries of comedy in the city and the history and role of humour in our conflict. Comedy has been important in challenging prejudice and it is widely accepted that encouraging people to laugh at themselves is often the most effective, and safest, way to tackle sectarianism,” explains Pete.“The only thing that is required for Belly Laughs is a good sense of humour,” he adds. “Running kids workshops as part of the festival is a really nice idea. I think children just love fun, they respond really well to imagination and fun. Anything that encourages that is great. Kids can do funny stuff and have a sense of humour. 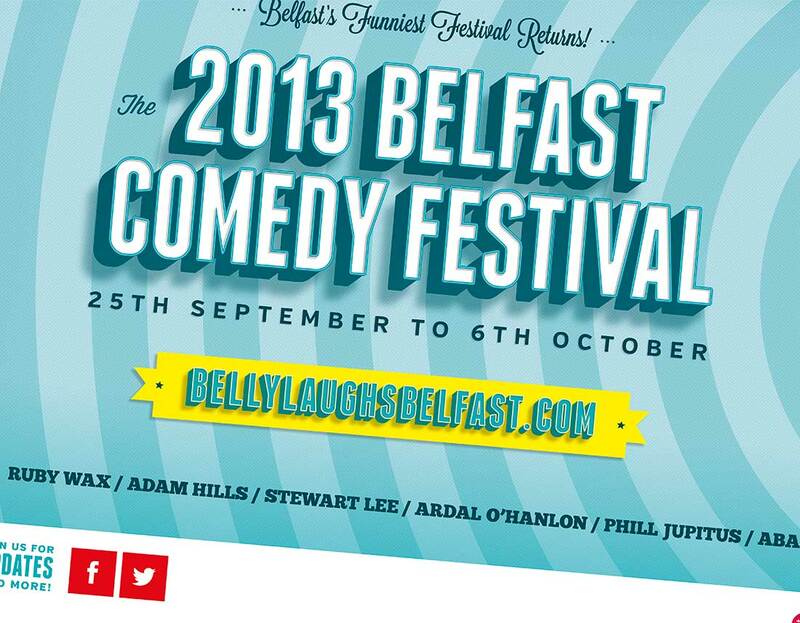 Many of the venues for Belly Laughs are located within the Cathedral Quarter and Nuala sees the area as a great place to showcase our local talent: “I think the Cathedral Quarter is the epitome of what is possible in Belfast and I think the arts is the most interesting sector we have here. That is what people come here for, to embrace culture. Anything that gets people out and having fun is obviously great for Belfast. Nuala’s advice during the Festival is to “try something you haven’t tried before.” She adds: “A friend of mine said they had a tourist day in Belfast and they went and did all the tourist attractions and had a great time”, so the comedy bus tour with Paddy McDonnell could be a way to see the sights with a few laughs along the way. Performer, Stephen Beggs, is part of the comic theatre group ‘Those who can’t’ and they be taking to the stage at the Black Box on 4 October with their show ‘Thunder Finger’.